In the latter part of the 1980s, to me there seemed to be a comedy movement coming out of the UK. This is different than what we had seen earlier in the decade with the likes of Adrian Edmondson, Rik Mayall, Jennifer Saunders, Dawn French, etc with programs like The Young Ones and The Comic Strip Presents. This was one that was created by Richard Curtis and Ben Elton. With a show like Black Adder (in any of its incarnation), there was some great comic talent emerging. This notably was, Stephen Fry and Hugh Laurie. These two gentlemen both were part of the Cambridge Footlights Revue and became a double act in the early 1980s. They both appeared in Blackadder II, Blackadder The Third and Blackadder Goes Forth as various characters in various forms. In 1989 they got their own series known as A Bit of Fry and Laurie. This lasted for four series but when it came time for an adaptation of P.G. 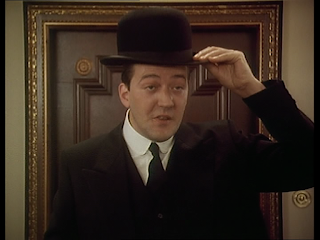 Wodehouse’s famous characters of Jeeves and Wooster to be brought to television, it seemed like a no-brainer that both Fry and Laurie were called upon to star in this series. The short stories and novels are fun and light hearted and needed two actors with similar qualities to take on the task of playing these wonderfully timeless characters. As for the characters themselves, P.G. Wodehouse first introduced us to these characters in the 1915 short story Extricating Young Gussie. However, these characters were still a work in progress. Jeeves as a character was not well defined and Wooster actually had the surname of Mannering Phipps. The Jeeves and Wooster we would know to come to love showed up in a short story in 1916 called The Artistic Career of Corky. For most of these stories, Bertie Wooster is the narrator. The short stories were later compiled into books and Wodehouse changed from writing these characters in short stories into full-fledged novel starting in 1934. Interestingly it didn’t take long for Jeeves and Wooster to catch on in other forms of media. The first film came out in 1935 Thank you, Jeeves! followed up in 1936 with Step Lively, Jeeves! both starring Arthur Treacher as Jeeves. Does anyone remember the Arthur Treacher Fish and Chips restaurants? I remember these when I young. Back in the day there were about 900 of them. Surprisingly there are around 45 of them now. I say surprisingly because I didn’t think there were any around at all! These films bared no resemblance to the P.G. Wodehouse stories apart from using Jeeves and Wooster’s names. 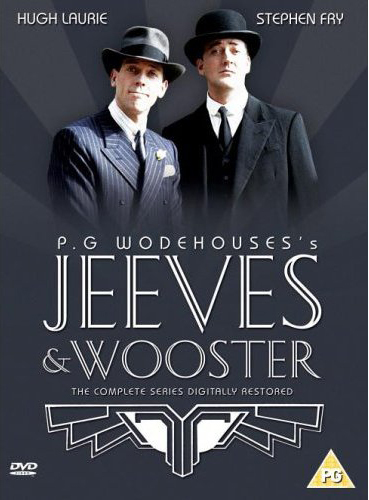 The first time Jeeves and Wooster made it on TV was in 1965 with a series called The World of Wooster. It was a comedy series with Dennis Price as Jeeves and Ian Carmichael as Bertie. Derek Nimmo played Bingo Little. I would love to see this but it is not that easy. Out of the 20 episodes made only 2 still exist. I may have these somewhere. I need to take a look and see. Surprisingly for radio there isn’t that much that has been made. There was a series made from 1972 to 1981 called What Ho, Jeeves! starring Michael Hordern as Jeeves and Richard Briers as Wooster. When tuning in to see this episode, it would be understandable to wonder if this was not the first episode. We are introduced to Bertie Wooster in court. He is clearly still drunk or horribly hung over and cannot even speak for himself. The best he can do is basically gurgle. He took the helmet off an officer earlier that night for some high spirited fun. After getting through that little escapade, Wooster goes back home and collapses in bed only to be woken up the persistent ringing of the doorbell. Bertie Wooster is part of the “idle rich”. You don’t know where these people got their money from but they really don’t deserve it. They don’t know what a day’s work is. Bertie Wooster is a mess and honestly could easily take up residence in the works of E.F. Benson’s Mapp & Lucia. Bertie, like Mapp & Lucia, live in a world where they have no idea what anyone else does. They just exist completely in a world of their own. Bertie is about to get some much needed help at the front door. At the front door is Bertie’s new valet, Jeeves. Within about a minute, he cleaned Bertie’s apartment and was able to fix Bertie some concoction that completely took away his hangover. After about 8 minutes of Bertie on screen, he finally utters his first lines of dialogue. Jeeves is impressive right from the start. Helpful, all-knowing and usually having a slight air of superiority over Bertie. That afternoon, Bertie has lunch with his Aunt Agatha who has news Bertie does not want to hear. Aunt Agatha wants Bertie to marry Honoria Glossop. She is a very sporty, outgoing and strong woman. Probably not the best fit for Bertie yet he has no choice but to go out to the country and see her. At the Glossop Manor, Bertie finds out that his buddy Bingo Little has a crush on her so it is in Bertie’s best interest to get them to fall in love with each other. Bertie has a plan, which only Bertie could come up with, which has him pushing a small child off a bridge while Honoria is there so Bingo can rush out of the bushes jump in the water and save the small boy. Everything is set and the kid is pushed off the bridge. The only problem is that Bingo isn’t there. Bertie jumps in to save the kid. Where is Bingo? Well, even though at one point he was absolutely in love with the muscular Honoria, he has now found a new love and plans to play golf with her. This incident makes Honoria adore Bertie and the only obstacle to married bliss is her parents. Now, Bertie already had breakfast at the manor with them and that didn’t really go to well. Now, back in London, Aunt Agatha has set up for Honoria’s parents Sir Roderick and Lady Glossop to dine at Bertie’s home. 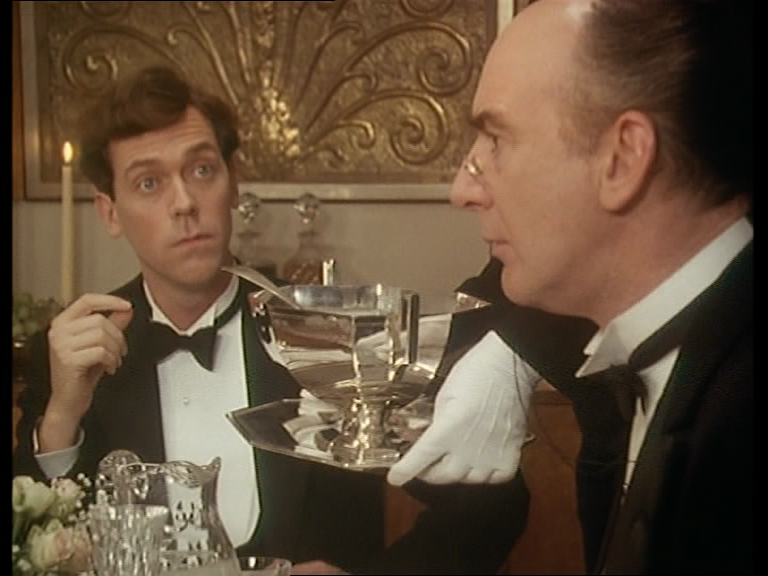 Bertie is all set, with Jeeves employed by Bertie nothing should go wrong except for the fact that Bertie is still going to attend dinner. Earlier in the day, friends from the club Bertie often resides in drove passed Sir Roderick and stole his hat right off of his head. Now at dinner, Bertie is really trying his best. After figuring out the seating arrangements which had all three members circle around the table multiple times, they sit down only for Sir Roderick to start hearing cats meowing. How is this possible? This is the worst possible thing that could happen since both Sir Roderick and Lady Glossop have an actual fear of cats. Earlier in the day, after the guys nicked the hat from Sir Roderick, they dropped by Bertie’s to see if he could hold onto the hat and also some cats that they got in some kind of trade. Now, these guys had no idea who Sir Roderick was or that they knew that Bertie knew him. Jeeves just agreed to hold on to everything. So at dinner, when Sir Roderick starts getting angry that he is hearing cats, Bertie assures him there are no cats and even opens to the door to show that there are no cats in the room. Of course, when he opens the door, three run out of the room. To add insult to injury, Sir Roderick asks for his coat and Bertie hands him his coat and his hat…..which was stolen earlier in the day. The engagement seems to be off. Now, was this Jeeves knowing his employers situation well enough to steer events in the right way to get Bertie out of his predicament? Of course it was! This is going to be the start of a beautiful relationship! It’s very funny and innocent humour. Even the act of stealing hats of policemen or Sir Roderick seem very tame and in good fun. The people never mean to do any sort of damage. They are probably so bored because they have so much money. Easily the highlight for me is the music and the opening credits. The open credits are one of the best in British or any television which really gives me a great impression of upper class 1930s England. All done with stylish animation, this is really a fun and sophisticated opening. What really gets things moving is the theme music. It is an original piece written by Anne Dudley. She won a BAFTA for it. It is simply amazing and here it is here for your enjoyment. 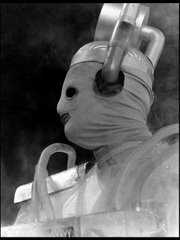 I watched this from the 2008 UK re-release of the entire series. It says it was digitally remastered. When I originally looked at it, I didn’t think there was much difference but after watching this episode, I noticed how great it looks and it is so much better looking than the A&E set. It was last released in the US in 2002. It was shot on 16mm film and as long as the film sequences still exist, there is no reason why we couldn’t see a Blu ray release like we have with Poirot which certainly hails from that same time. This would be great to see in the best quality possible. If you have never seen this series, I have some options listed below. This is a great, great series and since it was set in a certain period of time, it never ages. To me, this will always be the definitive article. Also: maybe you did or did not notice but after 5 years of doing this blog, I invested in giving this thing an actual URL. Hence forth we are now: www.from-the-archive.co.uk Yes, I know I am in the US but it seemed fitting to give it a UK url since it is all about British television. Let the confusion begin! Next week: What film franchise is 50 years old and is still releasing new films? Bond, James Bond. I am counting down over the next 7 weeks to the release of Skyfall. The only way to do that is go back and re-watch some classic Bond films. I start next week to where it all started: Dr. No. Coming up this week I will post DVD reviews for Midsomer Murders: Mayhem & Mystery Files and Special Branch: Set 1. If I ever get them in time to review I will also put up my reviews for Doctor Who: Ambassadors of Death and The Claws of Axos. Ahh, Jeeves and Wooster. What can I say, another all-time classic and a favorite of mine as well. I am glad I managerd to track down te soundtrack cd several years back - good stuff. Unfortunately for me(and fortunately for everyone else) the cd appears ot have been reissued in 2009, so it is not as rare as once it was. I didn't realize the CD got a wide release. A fantastic soundtrack just as good as the TV series. 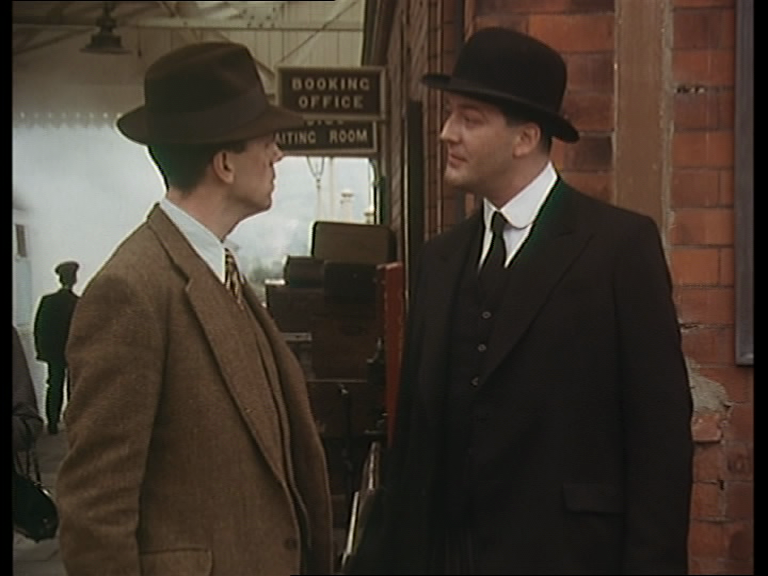 Jeeves and Wooster really was a marriage of great casting, great locations, great scripts, and great music to create an amazing series. One of the best!